The recipes that follow create meals that will please both your older (Stage Two or Stage One) baby as well as your entire family. Making these recipes will save you valuable time because now, there’s no need to prepare something separate for baby. Note that many of these recipes use meat, poultry, or fish. Just a reminder: It was once “the rule” that you should never place raw meat into a slow cooker and that the meat should always be seared and partially pan-cooked prior to going into the slow cooker. However, food safety experts now agree that as long as the meat is brought to its proper minimum safe temperature during the cooking process, it is completely safe to cook raw meats in the slow cooker. 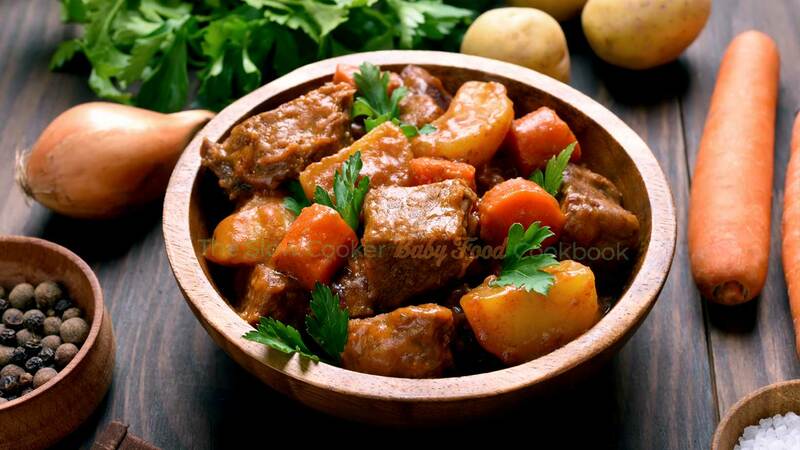 Most slow cookers will cook between 190˚F and 300˚F (90˚C and 150˚C). Therefore, as long as the food that you are cooking is brought to the proper temperature, there will be no food safety risks with slow-cooking meat, poultry, and fish. Rinse the meat and pat dry with paper towels. Season with ground pepper and other seasonings of your choice, if desired. Place the meat in the skillet and cook or sear; be sure to turn the meat to get an even browning/sear on all sides. Again, remember that this step is completely optional. And, of course, always wash your hands after handling raw meat, poultry, or fish of any kind. A seasoning note: You may notice that some of the seasoning measurements seem “small” for the size of the recipe. Because these meals will also be served to your little ones, the seasoning additions are mild. Please feel free to add more should you like a more flavorful dish and feel comfortable that your kiddos will enjoy more flavor, too. Of course, you could also remove the seasonings if you prefer.